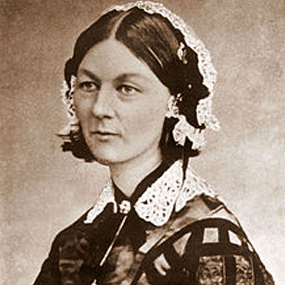 Florence Nightingale was born on 12th May 1820 in a rich, upper-class British family at Bellosguardo, In Florence, Italy. Florence was named after her place of birth. She was the daughter of William Edward Nightingale and Frances or Franny Nightingale. Williams mother Mary Evans was the niece of Peter Nightingale and according to his will, William would inherit his estate. William thus assumed the name of Nightingale. The first five years, Florence was brought up at Lea Hall but the family soon shifted to Lea Hurst in 1825. Florence soon began to visit hospitals in and around London as she wanted to take care of the ill. Nursing was not a profession that required intelligence but, was considered to be little less than prostitution. Florence believed that it was God who had directed her to be a nurse and thus, in 1844 Florence told her family about her intention to enter nursing. Her decision was strongly opposed by her sister and mother. The outbreak of this reaction was perhaps because Florence like any other girl was expected to get married and take care of her husband and family. However, Florence had clearly refused to marry anyone saying that it would affect her career. Another reason that influenced Florences decision to be a nurse was her meeting with Elizabeth Blackwell, the first woman to be qualified as a doctor. In 1847, Florence met Sidney Herbert, a politician who played the key role in the 1845-1846 Crimean War. Herbert and his wife played a major role in Florence’s life by extending their support to her work during the Crimean War. It was the trip to the Lutheran religious community at Kaiserswerth-am-Rheim that changed her life. Her experience was penned down by Florence in her first published book in 1851. In 1853, Florence was the superintendent at the Institute for the Care of Sick Gentlewomen, London. She remained at the post for about a year. Florence Nightingale is famous for her work in nursing during the outbreak of the Crimean War. In 1854, Florence and a staff of 38 women volunteer nurses who were trained by Florence were sent to Crimea where the British army had set up its base. On reaching, Florence discovered the poor and unhygienic conditions in which the wounded soldiers were being treated. The improper conditions led to infections and eventually death of the soldiers. In 1856, Florence had a brief interaction with Queen Victoria and Prince Albert after which, Florence gave evidence to the Sanitary Commission, established in 1857 regarding the poor and unhygienic conditions at the hospital. The Army Medical College was formed after this inquiry. This Commission reached the hospital after Florence and her staff had been working there for not less than 6 months. The Commission inspected the hospital area and reached a conclusion that lack of ventilation and unclear sewers were the perils for the deaths of the soldiers. The cleared sewers and improved ventilation drastically reduced the number of deaths. After her return to Britain, Florence collected evidence and submitted it to the Royal Commission on the Health of the Army. Florence believed that the poor and inhabitable conditions at the hospital were the cause of death of the soldiers. During the Crimean War, Florence was also known as “The Lady with the Lamp” as she would take rounds at the hospital with a lamp in her hand. 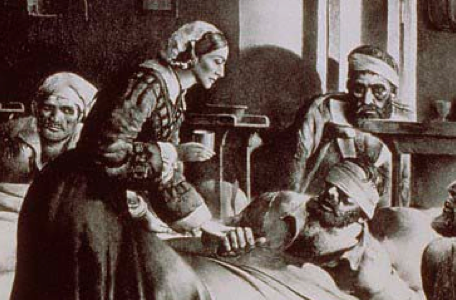 In 1855, The Nightingale Fund for the training of nurses was established to recognize Florence Nightingale for the work done during the Crimean War. The fund received numerous donations and Sidney Herbert was the Secretary of the fund and Duke of Cambridge was its Chairman. Florence was regarded as a pioneer of medical tourism. In 1860 Nightingale Training School was established at St. Thomass Hospital with the help of the funds gathered from the Nightingale Fund. The School is now known as Florence Nightingale School of Nursing and Midwifery. Florence wrote a book Notes on Nursing, published in 1859, which was to educate those who were nursing at home and at the same time, gave an insight of the curriculum of the Nightingale School. Other popular books written by Florence were Notes on Hospital, Notes on Nursing, etc. Florence was also known for introducing trained nurses who worked in the workhouse system in England and Ireland from mid 1800. In 1870, Florence trained Linda Richards, first American to be a trained nurse. Florence was awarded the Royal Red Cross by Queen Victoria in 1883 and in 1907, she was the first woman to who was awarded the Order of Merit. Around 1857 onwards, Florence’s health deteriorated and she was bedridden. She thus led an invalid life for some time. It was said that the reason for her poor health was depression. Despite her condition, Florence did a lot of work in the area of hospital planning and her efforts were not only recognized and known in Britain, but they also became popular in other countries. On 13th August 1910, Florence died at the age of 90 years and was buried at St. Margaret Church in East Wellow, Hampshire.